Why don\'t HT doctors cut strips vertically? I have not had, and I don’t plan on having, conventional strip HT performed, but it seems to me that scars would be A LOT less visible, and even might heal better, if, say, instead of one big horizonal strip being removed, say, four smaller vertical strips were taken in parallel at the back of the scalp. 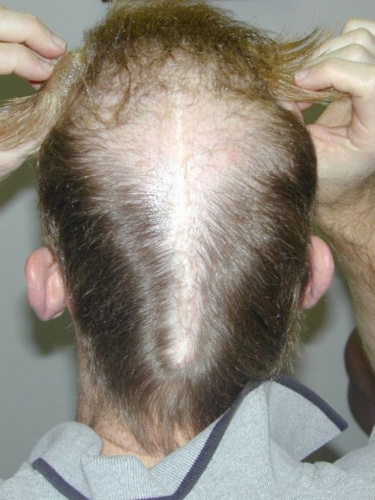 At least any scar lines would be flush with the direction the hair grows, not perpendicular to the growth of the hair. Also, it seems that there’s more suppleness and elasticity to the scalp in the lateral direction, which would allow the skin to be stretched easier, under less force, by closing the incisions from side to side rather than up and down. »Why don’t HT doctors cut strips vertically? Why don’t we shingle a roof vertically? » direction the hair grows, not perpendicular to the growth of the hair. I disagree, that will not make any difference, the scars will still show and besides, you may need to cut more vertical strips to equal the typical horizontal strip that can go from left ear to right ear. It probably would not be very practical and almost impossible to hide. It would be like having a permanent part in the the back of your head and if it stretched to a couple of cm it would look completely bizarre. Some patients who have experience with the hairlift know all too well. There tends to be somewhat a of a vertical scar that they are left with in the crown and concealment is helped with a z-plasty. » it stretched to a couple of cm it would look completely bizarre. » Some patients who have experience with the hairlift know all too well. » the crown and concealment is helped with a z-plasty. so hard to conceal…vertical scars --big no! !